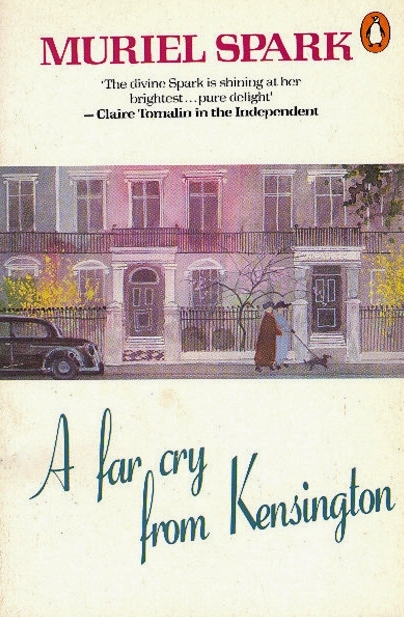 A Far Cry From Kensington by Muriel Spark ~ 1988. This edition: Penguin, 1989. Softcover. ISBN: 0-14-010874-2. 189 pages. I am breaking my several-weeks’ book-discussing silence to applaud this brief novel by the increasingly enjoyable Muriel Spark. Isn’t it interesting that there sometimes seems to be a proper time for certain writers in a reader’s life? I think I may have entered into a deliciously Spark-ling phase of my own, for recently I found The Mandelbaum Gate to be unexpectedly good, as is this other nicely crafted thing. A Far Cry From Kensington turned out to be happily mesmerizing, being a tightly written tragi-comedy narrated by once-obese Mrs Hawkins – I mention the obesity because it is crucial to the plot in a most bizarre way – looking back three decades to her life in 1954-55. At the period of time which is the focus of her reminiscences, Mrs Hawkins works “in publishing” – she is employed as an editor at a soon-to-be-doomed small press situated in Kensington – and throughout the novel we get intriguing glimpses of the workaday side of the flourishing-yet-troubled literary scene of London in the 1950s, an era and an atmosphere which Muriel Spark knew in intimate detail. Living in a rooming house presided over by the warmly maternal and personally high-principled Milly, Mrs Hawkins is fortunate in her housemates, whom she describes with concise but living detail: the ultra-respectable and preternaturally quiet married couple, the Carlins – he an accountant, she a nursery school teacher; the cleanliness-obsessed district nurse Kate; the gloomy and excessively emotional Polish seamstress Wanda; the young and vivacious post-deb Isobel, trying out her downy wings in London as a secretary, though in constant close contact with her doting father via a private telephone of her very own; and, not least in eventual importance to Mrs Hawkins’ personal story, the brilliantly promising, dragged-up-by-his-own-bootstraps medical student William Todd. All of these lives are intertwined with that of Mrs Hawkins; some exceedingly closely, as we will discover later in the narrative, though Muriel Spark frequently dangles just the briefest, most tantalizing fragments of information in front of us in the course of Mrs Hawkins’ tale. Mrs Hawkins is prone to giving advice, much of it quite good, as it turns out. Pragmatic common-sense spiced with opinionism is Mrs Hawkins’ style. We learn how simple it is to lose weight (eat just half of your regular portions, and then, when the willpower is adjusted, half again); to control rheumatism (eat a banana a day, as advised by “an American negress met on a bus”); to write an engaging narrative (pretend one is writing to a single close friend); to attain concentration (acquire a cat). This last was one of my favourite asides in this vignette-rich novel. At a dinner party, Mrs Hawkins meets a gruff, red-faced, retired Brigadier General, who mentions that he “could write a book” about his life. So I passed him some very good advice, that if you want to concentrate deeply on some problem, and especially some piece of writing or paper-work, you should acquire a cat. Alone with the cat in the room where you work, I explained, the cat will invariably get up on your desk and settle placidly under the desk-lamp. The light from a lamp, I explained, gives a cat great satisfaction. The cat will settle down and be serene, with a serenity that passes all understanding. And the tranquillity of the cat will gradually come to affect you, sitting there at your desk, so that all the excitable qualities that impede your concentration compose themselves and give your mind back the self-command it has lost. You need not watch the cat all the time. Its presence alone is enough. The effect of a cat on your concentration is remarkable, very mysterious. If you smiled sympathetically at this excerpt, this book is for you. Read it, then, and discover just what a pisseur de copie is, and what significance The Box in the esoteric (and deeply weird) practice of radionics holds, and just what Muriel Spark really thought about one of her ex-lovers, here immortalized as the deeply dislikeable Hector Bartlett. And, for another agreeable opinion, click on over to His Futile Preoccupations, one of many other favourable reviews of this quietly malicious minor masterpiece. A great favourite of mine, I love this book. My favourite bit comes when Mrs H and Milly sit on the stairs to get a good view of the row going on next-door, and Milly goes and gets some chocolates for their further enjoyment. I am also quite fascinated by The Box, which was quite a craze in the 1950s, and features in Evelyn Waugh and Agatha Christie. I had to look up Radionics, and what I discovered was absolutely enthralling, in a horrifying sort of way. People are so very strange…! Smiled? I actually laughed at this utterly charming excerpt. OK, you’ve done it again…..enticed me into adding yet another book to my toppling pile. But I’ve learned to trust you after “The Innocents.” This sounds just my “quietly malicious” cup of tea. It’s very good – and quite a lot easier to find than anything by Margery Sharp! I was just going to write Silver in the Barn’s exact words…thank you for quoting. Delicious! I love Muriel Spark and this is one of my favourite of her novels. So glad you loved it! Have just discovered your blog recently (don’t know why I haven’t been reading book blogs considering that I’m an inveterate reader) and I now have entirely too many new books on my to-read list. Our taste in books seems to coincide for so many authors that I’m eager to read some of the ones that are new to me (Dorothy Whipple, Anna Buchanan) and revisit a few I haven’t read in a long time (Margery Sharp, Muriel Spark). Thanks! Oh, wonderful review. It’s a few years since I read and enjoyed this novel and you have inspired me to go and re-read it. High time for a Spark top-up of quiet malice.